Home CollaborationBIM Collaboration	Can Your File-Sharing Software Do This? Can Your File-Sharing Software Do This? File-sharing for architects and engineers needs more than just online storage space. The architects at Hennebery Eddy and Fentress, two design firms who partnered on the Terminal Balancing Project at Portland International Airport, seem to think so. They deployed an industry-specific, highly-collaborative solution that allowed them to co-author the same BIM model and share other design files types in a common project repository. “We’ve been using [this] technology to be instantly up-to-date between the two offices,” says Michelle Vo, Principal at Hennebery Eddy in Portland. Without such a solution, the project would undoubtedly have taken several more months to complete. If you are like more than half of AEC professionals in major markets around the world, you work in a BIM environment. Because of BIM, the concept of a “single source of truth” or centralized model for project data is well-established in your process. But if you’re still working with a paper-based or 2D process for documentation and project management, or relying on latency-ridden solutions like internal servers to sync large BIM models, you’re missing out on some major efficiencies with BIM collaboration and file-sharing that could make your life much easier. Being able to easily access information in one place can add up-front efficiencies to your process, which in turn create time and cost savings. What are some key-file sharing features you wish you could use? Can your file-sharing software do this? Whether you have a server setup on a WAN/LAN or you’ve paid for business accounts with an online file-sharing service, you probably already use file-sharing software to view, edit, and download 2D drawings and layouts. But is your file-sharing solution tailored to your project needs? Can you view CAD, DWG, NWF, NWD, DXF, RVT, or SKP files easily? Can you co-author your BIM model intuitively and easily without disrupting workflow? Can others view your BIM model even if they don’t have BIM authoring software on their machines? BIM 360 Team can open and share over 50 types of design file formats (and 100 different file types in total). It can serve as a central repository for design project documents. With discussion spaces that double as project wikis and a calendar to track important deadlines, your project can be managed from start to finish with BIM 360 Team. You’ll have 500 GB of cloud storage space available per user to create as many projects as you like. Add team members as ‘Viewers’ or ‘Editors’ to control user permissions and access. In your design studio or engineering firm, every extra bit of space counts! Whether you or your client prefers 2D or 3D models, handling a large amount of data is inevitable. Because design file sizes range anywhere from 1 MB for CAD drawings to 1 GB for complex 3D models, you need all the storage you can find. When you upload files, do you regularly run into warnings alerting you that you’re running out of space? Do you experience latency or lag when it’s time to sync everyone’s changes for the day to the model in the server? Most importantly, if you work in a BIM model, is your shared model viewable in 3D with no lossy renders? Do you have to fire up the original design authoring software on a desktop or laptop every time you have to open a Revit file? Do you see “Files can’t be previewed!” alerts when trying to open an related data sets with .RVT or .NWF extensions from your laptop, tablet or phone? When BIM 360 Team is used with Collaboration for Revit it delivers a holistic, integrated experience within Revit that allows real-time design collaboration through cloud worksharing. You can access the latest, updated, and synced-to-central model from Revit using Collaboration for Revit. Walk-through, section, and explode your 3D model in an immersive viewing experience right within your browser. Sync, upload, and download your files faster with the power of the cloud, without the usual latency or lag typically experienced when using servers. Jump from model views to sheet views easily, from anywhere within your project. It’s easy to open a 3D Revit model in your browser using BIM 360 Team, design collaboration software made for architects and engineers. On the other hand, you could run into error messages when you attempt to open the same model using a regular file sharing website. The amount of data we interact with it has exploded because of cloud computing. It has changed the way we work and share information.The era of having to wait to go back to your office to make changes to a plan or to update files is long gone. Productivity at work today is no longer limited by your physical location, so the ability to provide on-demand feedback while viewing project files is crucial. Has that trend followed you into your design and building processes? Can you quickly access design files while at a remote office, in transit, or while visiting the job site? Is your model housed in one central location, without having to go in and out of different software, networks, or devices? Can you view the latest 3D version, and directly markup and comment on the model in a browser on your phone or tablet? View project information anytime, anywhere, from any device with the BIM 360 Team mobile app. Sign up for a free trial of BIM 360 Team. You’re used to wearing many hats on the job. You multitask to keep up with the pace of the project. How easy is it to get technology to work for you, so you can meet deadlines and smash those goals? When you’re scanning emails with your morning coffee or traveling during an important phase of the project, you spot a structural connection issue in the model. Can you easily leave feedback at the exact moment you see the issue appear? Can you directly markup and comment on the model or CAD drawing in your browser? Can you search the model to see if the issue is replicated in other families or is just a one-off occurrence? BIM Team allows markups and comments on the model easily while in 3D view, while saving a snapshot of the exact view of the model at time of markup for reference. If you are a principal architect or lead engineer, a design review is a critical meeting to host. The design review is an important step for your extended team to prepare for upcoming project milestones, and for you to gather constructive critiques of works in progress. Can you share your design with the project owner, specialists, and or other external stakeholders on-demand in a live review session? Can you walk-through, orbit, explode or section your model during review, just like you would in your design authoring workspace? Are you able to chat with other team members while simultaneously reviewing the model on your separate screens? How easy is it to find related components or search for model elements in the project? For a successful in-house review, everyone must be on the same page, or in this case, in the same view of the model. 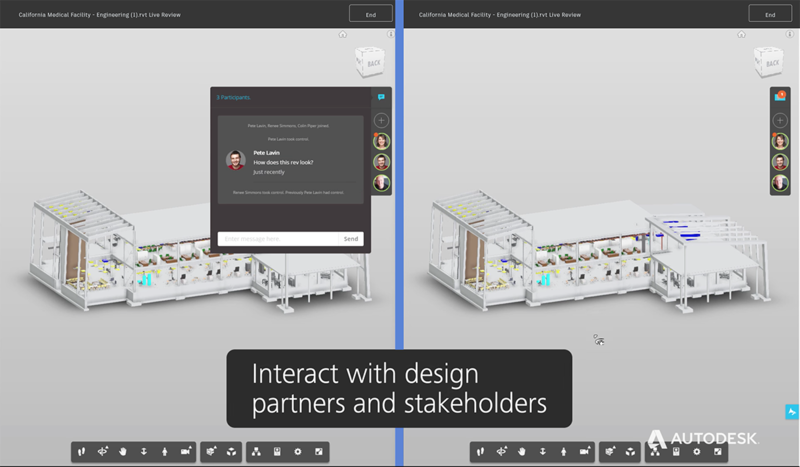 BIM 360 Team lets you host and share a ‘live review’ session with anyone outside your hub, where they can view and comment on the model directly in their browser. Participants can also send questions and messages to the entire team using the chat feature during a review session. Screenshot of live design review taking place simultaneously on two user’s screens. After spending so many hours on a project, every team needs a clean and clear way to compare versions. Navigating version comparisons within a 3D model is overwhelming to begin with. If your project is large in size, scope, or team, or you’re managing difficult site conditions, file coordination becomes even more complex. Can you quickly tell if the changes you asked for made it to the next version of the model or drawing? Can you see if they were applied to all component families? Does your file sharing software allow you to track project activity within the model? Can you view changes by the affected discipline, such as structural, architectural, or MEP? Can you easily search and filter amongst those changes? 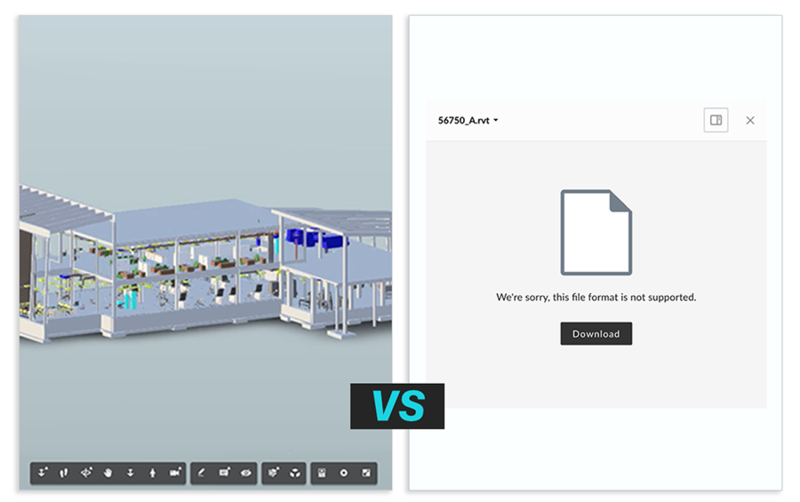 With BIM 360 Team, you can compare model versions with the click of a button, and filter changes by discipline or by modification type such as shape, transformation, or property change. Sign up for a free trial of BIM 360 Team. Building design and infrastructure projects require an intuitive, 3D-centric file-sharing experience. 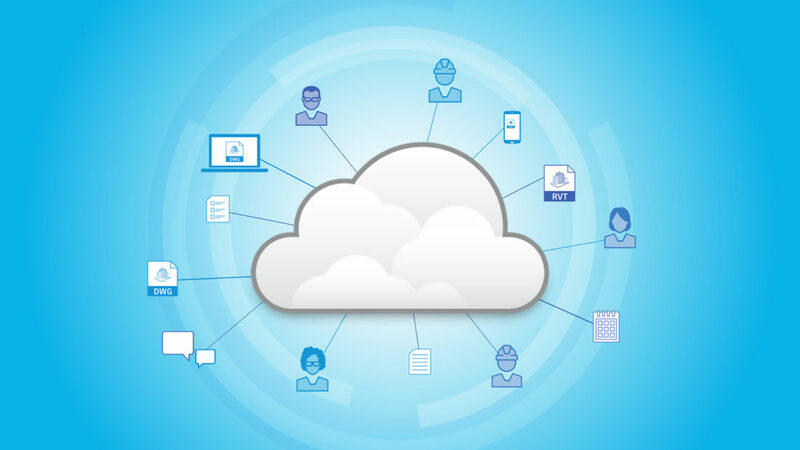 BIM 360 Team is a powerful cloud-based file-sharing platform made especially for that purpose. Using BIM 360 Team means uninterrupted 3D file sharing in the cloud directly in your browser. sign up for BIM 360 Team today. See how Fentress and Hennebery Architects used BIM collaboration to work as one on the PDX International airport. Esther Dsouza is a Product Marketer for BIM 360 Design at Autodesk. She likes hiking, biking, farming, and making things. BIM Collaboration Across the Pond, LIVE! Thank you for subscribing to the Convergence blog. Convergence connects people, information, and processes across architecture, engineering, and construction.